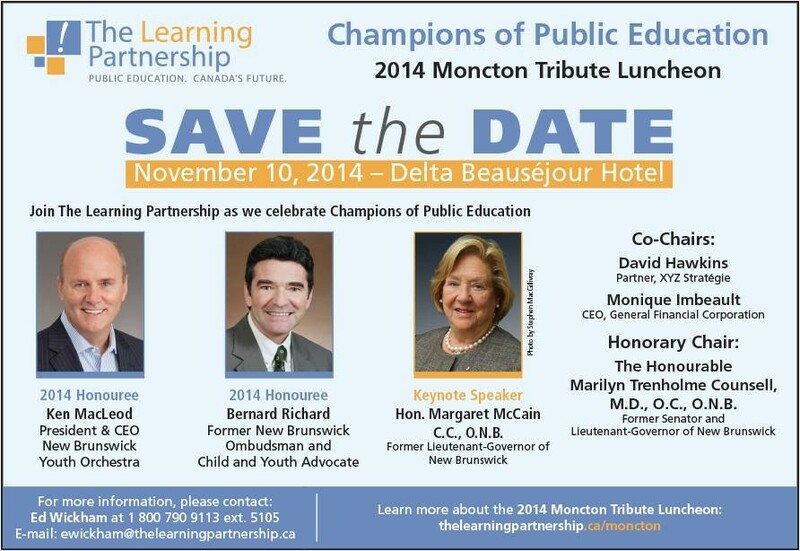 The 2014 Learning Partnership Tribute Luncheon will be held at the Delta Beauséjour in Moncton on Monday, Nov. 10, honouring two outstanding individuals who have contributed greatly to education in New Brunswick: Ken MacLeod and Bernard Richard. The keynote speaker will be former New Brunswick lieutenant-governor Margaret McCain. Click on the photo for a larger version. Click here to purchase a ticket or table for the event. ← Reminder: Turn your clocks back by one hour this weekend!